Syfy released a new season 3 trailer via EW yesterday. You can see it below, along with lots of screen caps and speculation as to what is going on. Note: Most of the years noted below come from tags on Terry Matalas’ Instagram. We start off with a montage of previous season footage and a voice over from Jones, probably what will open season 3 (like Madeleine Stowe’s voice over at the beginning of season 2). Jones: Let me start at the beginning. Three years ago I sent a traveler, back in time, to change history. 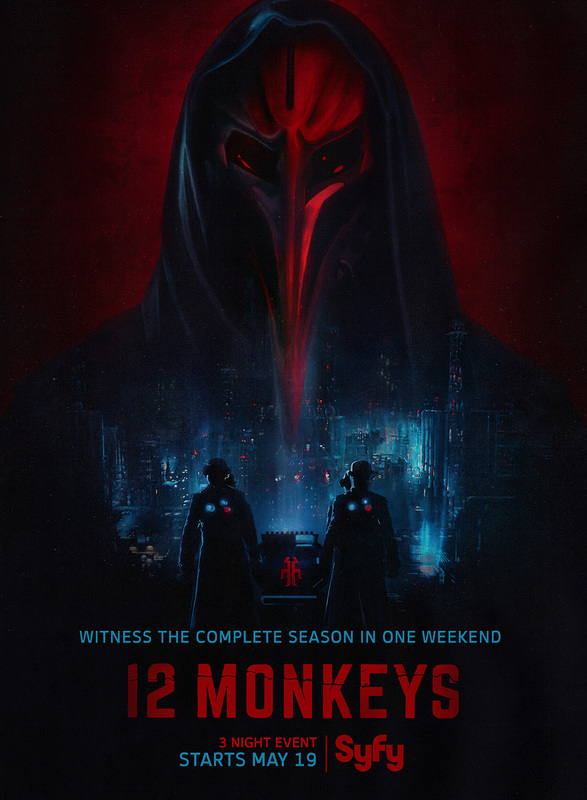 To save the future from The Army of the 12 Monkeys, and it’s prophet, The Witness. But as fate would have it, we were hunting the wrong man. It looks like Cole has stumbled on to the set of ‘I Am Legend’. He seems to be in future New York. 2044? 2163? Is he carrying a trident? We saw this in the previous promo. Likely Titan in 2163, sitting on the shore of a shallow body of water. The creepy Titan altar, which Pallid man is standing on, surrounded by Titan guards or followers. That looks like it could be Christopher Lloyd’s character walking up the altar. Someone crouched in a spiral of symbols, possibly a Primary (it looks like something they would draw). Ominous figures with glowing lights on their chests. They look like they’d fit right into a Doctor Who episode. These appear to be the same people carrying the modern Ark of the Covenant-like device on the Season 3 poster. Cassie looking at The Word Of The Witness, probably in Titan, as it appears she is wearing the same clothing as later in the promo (when she is looking at The Witness mask). Cole: The man behind the apocalypse is my son? Jennifer and a young boy standing in front of a graffiti version of The Mark of The Witness. Is that young boy The Witness? Cole and Cassie heading into a masked ball. Apparently this scene is set in 1899. Cassie and Cole walking down a street in 1891. A sad looking Jones talking to someone. Cassie and Cole appear to be a happy couple. Not sure what year this is. The clothing looks a lot less formal than the previous pictures and Cassie’s hair is not as fancy. Early 20th century? ETA: This may still be 1891, as Cole’s vest looks to be the same as the scene where they are walking down the street. Ramse: About time we set things straight. The Emerson Hotel in the 80's. Jennifer looks thrilled to be there. Cole appears to be cosplaying as Marty McFly and Deacon as Detective James Crockett from Miami Vice. Cassie: Help me save him. Christopher Lloyd’s character wearing ‘The Mark of The Witness’ pendant. Is it the one Olivia left on Mantis’ grave or does everyone have one? A female character looking at Primary-esque sketches of Cole. In every one he seems to be aiming a gun and we see another symbol spiral on one of them. This is followed by a shot of a teary-eyed Cole aiming a gun (just like in the sketches!). Cole: If there’s something wrong with him, he got it from me. Olivia behind a fence. Is it just me, or does she really resemble Tricia Helfer in this picture? Olivia: The very edge of time... an inch from falling over. Cole, with a bloody lip, possibly in the 1920s. Is he back there to retrieve Jennifer? Cassie looking at The Witness’ mask. In Titan? Jennifer talking to someone, likely Olivia, given the fence. Jennifer: Stop talking like a super villain. Jones: Don’t make me put you down. Cassie in her red dress, surrounded by Titan guards. Cassie at Titan, having dinner with someone (Pallid Man?). The Mark of The Witness can be seen on the front of her dress. They really like to put that on all their clothing at Titan. It appears Cassie and The Army are having custody issues regarding baby Witness. Cassie, in what appears to be the immersion bath from episode 205, or one similar. She’s seems to be screaming in pain. Is she giving birth to The Witness? A gleeful Pallid Man stands over Cassie. An unknown character played by Hannah Waddingham. The device on her chest indicates she is probably one of those people with the lights and top hats, seen earlier. Unknown lady: You can’t have him. Cassie and Cole heading up the aisle of a church, where a man stands. The dialogue indicates this is The Witness (played by James Callis). The Witness removing his mask. Syfy will be showing the entirety of season 3 (10 episodes) over three days, starting May 19th.